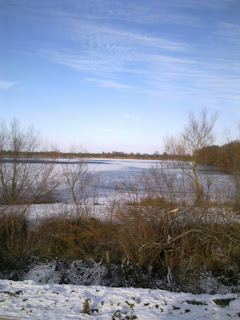 We've been for a lovely snowy walk to St Ives today, and I was cross with myself for not taking the camera. Then I thought you have your new phone take some with that, so I did. I then thought ummmm how do I get them to my computer, quick look through the instructions, plug in the usb, fiddled a bit then like magic my pictures appeared. Quite chuffed with myself actually. 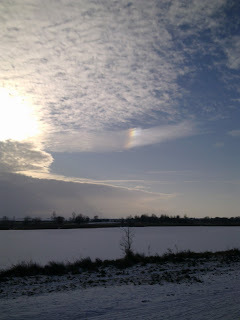 The pictures show the frozen lakes on the RSPB reserve at Fen Drayton, also you can just see a snow-bow in the sky, it looked really pretty in the flesh so to speak! Beautiful pictures and great new blog page! I love the baby clothes. you are so talented!